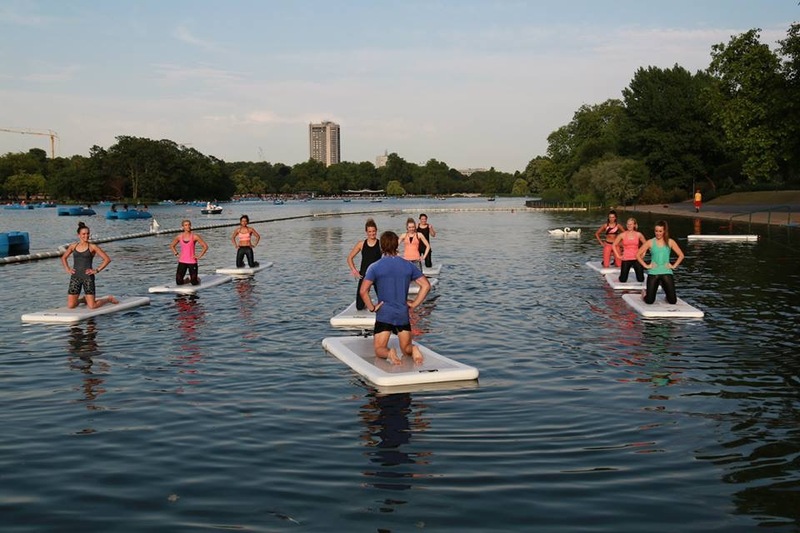 Last week, courtesy of fellow fitness bloggers and uber babes Lu de Lux and Pig to Rig I was invited to the Serpentine in Hyde Park to take part in the launch event for Aquaphysical who in their words “enjoy using the natural fluidity of water to achieve flexibility, stability and strength” on the very first water based responsive exercise mat. When I received the invitation my fitness curiosity got the better of me and I instantly accepted, but as the date drew nearer and reports were growing that the launch date was going to be the hottest day in London for 10 years I could barely contain my excitement. I’ve often seen or heard about people who go swimming in the Serpentine (which runs through London’s gorgeous Hyde Park) and quite frankly always thought they must be mad to willingly throw themselves into freezing cold Thames water, but on Wednesday evening with the temperature still north of 30 degrees I couldn’t think of anything better. I was lucky enough to take part in two of the Aquaphysical classes – the first one a 30 minute HIIT workout and the second a 30 minute sunset yoga session. Both were amazing and challenging in very different ways. 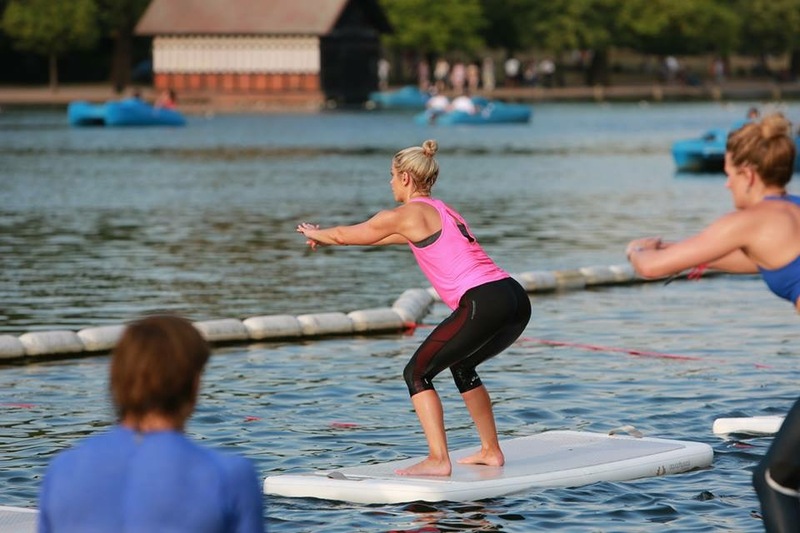 I consider myself fit and would like to think I have decent core strength, but balancing on the responsive board, on the water was much more challenging than I was expecting. Our instructor for the HIIT got us started slowly with some basics like squats and push ups, but even these were tricky to master and before the end of the round of squats I could already feel my glutes starting to tighten! When the jumping on the board started I really had to up my game – staying upright was tricky and required a lot of concentration and abs of steel, thankfully I didn’t take a tumble into the lake but came close a few times. Of course I had swum out to my board, and in between rounds of work we were also asked to jump in and tread water to keep our heart rate up, so being immersed with the seaweed and the ducks was the least of my worries – it was much more about keeping my dignity intact and jumping in willingly rather than sliding off head first (I won’t name names, but this happened to a few participants…!). When I woke up the next morning I could REALLY feel my arms, glutes and core – surprisingly so. Amazing what a huge difference the board and the water made to relatively simple exercises and how much this must have upped the intensity for me to get DOMS quite so severely and so quickly after the class. I would do Aquaphysical HIIT again in a heartbeat! An amazing, all over workout in the most stunning of surroundings. The yoga class that followed was nothing short of incredible. Kathryn Fielding took us through 30 minutes of stretches and sequences – most of which were familiar to me, but once again, the added challenge of performing the moves on a totally unstable surface that was both weight and gravity responsive was unbelievable. My flexibility isn’t great at the best of times, but even maintaining a downward dog was tricky at first until my core really got to grips with the instability and movement of the water. Whilst I love to push my limits, especially when it comes to fitness, sometimes sense does kick in and I was old enough to know that attempting a handstand at the end was never going to happen for me – but look at how easy and graceful Kathryn makes it look! With the sun setting over the park in front of us I was almost sad to dismount my board and paddle back to shore, I loved every minute of both the HIIT and Yoga class (minus maybe the trying desperately not to fall in whilst attempting a burpee) and cannot recommend the Aquaphysical workouts enough. Thank you Louise (pictured above in the green) and Rachel for inviting me to the most perfect Summer Serpentine evening! 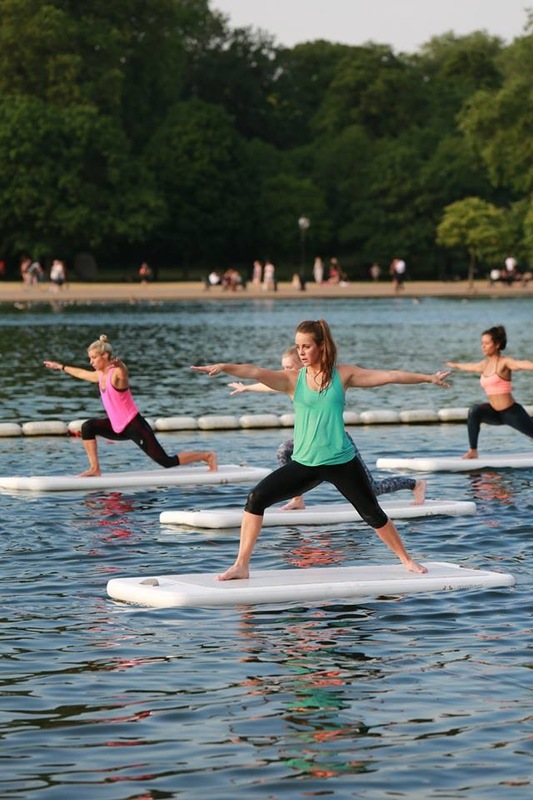 If you would also like to be invited to incredible London fitness experiences like this one, check out the girls’ brand new venture, The Privee Project and sign up to their mailing list to be the first in the know for upcoming workout events – I guarantee you won’t regret it – but I can’t guarantee you won’t get wet….. Incredible photos by Kate Cowdrey and (c) Kate Cowdrey. that looks so cool! I would fall in the water however!